Published on the Ms. Magazine blog on March 20, 2015. You might think that journalism today is a woman’s game. After all, women make up the majority of students at journalism schools across the country. Yet their dominance seems to end there. Men still claim the majority of bylines and outnumber women in newsrooms. It’s enough to dishearten even the most passionate and dedicated female news hound. So perhaps it’s important for us to honor one of the most impressive women journalists of the 19th and early 20th centuries: Nellie Bly. Sure, men dominated the news profession even back then, but this woman was able to hold her own. In fact, she ended up stealing the show. 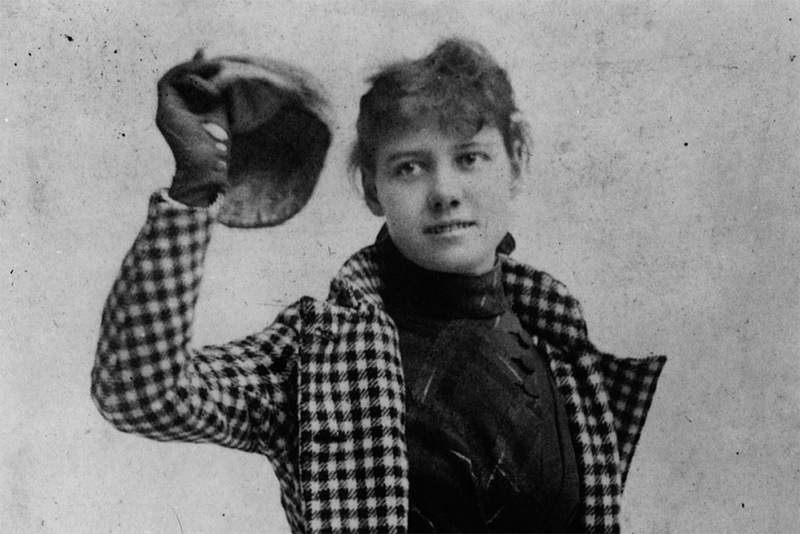 When you read Nellie Bly’s life story you can’t help but wonder, “How come Hollywood hasn’t made a movie about her yet?” It would be box office gold! Nellie’s real name was Elizabeth Jane Cochran, and this budding journalist got her start after she wrote a passionate letter in response to an op-ed in The Pittsburgh Dispatch that said girls and women were only good for domestic work. Though she was only 18, the editor was so taken with her writing he later offered her a job. He picked a nom de plume for Cochran, as was customary for women writers at the time, and thus Nellie Bly was born. Clearly possessing an interest in investigative reporting, she tried to write about the downtrodden, even going so far as to impersonate an indigent factory worker for a story. But she kept getting consigned to write for the women’s section of the newspaper, where she was expected to cover more ‘feminine’ pursuits, like fashion. But Bly wanted more for herself. So she relocated to Mexico as the paper’s foreign correspondent. She had to flee when her own safety was threatened after she slammed the Mexican government’s incarceration of a local journalist in an article. Back in Pittsburgh, despite her previous intrepid reporting, she was once again assigned to cover frivolous stories. She finally quit The Pittsburgh Dispatch and got a job at Joseph Pulitzer’s New York World in 1887. Her coup d’état there was a gripping exposé on the terrifying and cruel conditions at mental institutions. Just 23 years old, she went undercover feigning to be deranged and was confined in an asylum for 10 days until her paper secured her release. She described how patients suffered extreme unsanitary conditions and inhumane treatment. Though some dismissed her work as ‘stunt reporting,’ her courageous journalism led to institutional reforms. It also put her on the map. She gained international fame in 1889 when she traveled around the world in 72 days, all the while chronicling her journey for New York World. Inspired by Jules Verne’s Around the World in Eighty Days, she had wanted to beat the main character’s travel record and succeeded. Bly left journalism when she was only 30 to marry a millionaire who was in his 70s. She was later named the president of his Iron Clad Manufacturing Company and patented a number of her own inventions during this time. Unfortunately, she was left bankrupt after her staff got greedy and embezzled money. But lucky for us, she chose to go back to her reporting roots to earn a living. Bly ended up covering the 1913 women’s suffrage parade as well as World War I. She died of pneumonia when she was 57. Image courtesy of the Newseum.